The Five Points Neighborhood Association has written a press release about a project we recently supported. Read on to find out the impact a few passionate neighbors can make! 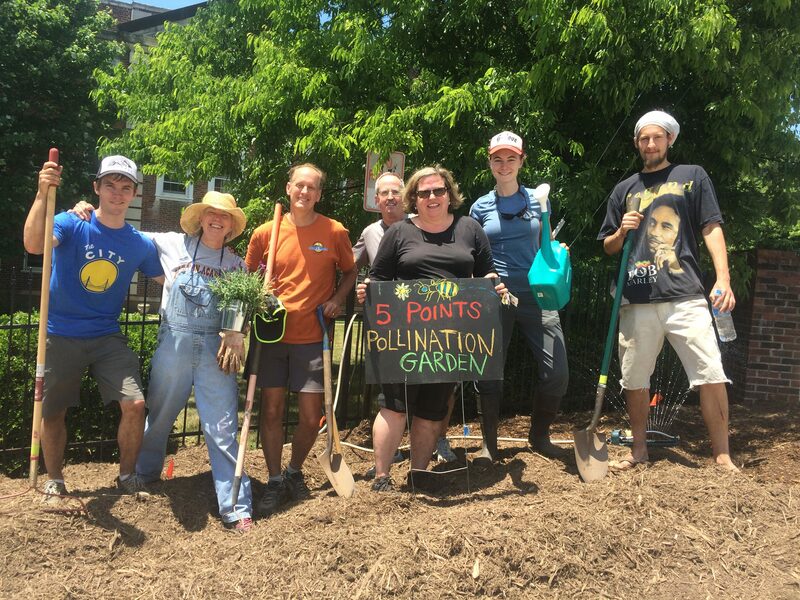 Asheville, N.C. – Residents of Five Points Neighborhood will cap off a long effort to beautify a busy corner of their neighborhood on Saturday, June 11, as they finish work on a new pollinator garden. Five Points resident Susan McBride has led the neighborhood association effort to create this garden in the public right-of-way at the intersection of East Chestnut Street, Maxwell Street and Monroe Place. Two years ago the space for the garden was created along with improvements meant to ease the impact of traffic from the new Harris Teeter and Trader Joe’s stores. The plants in the 25′ by 8’ garden have been chosen for their ability to feed and nurture pollinators such as bees, wasps, butterflies, moths, some beetles and even hummingbirds and will include bee balm, daisies, catmint, asters, cardinal flowers, black-eyed susans, gay feather, oregano, lavender, meadow sage, and milkweed. McBride and neighbor Gillian Scruggs, an Organic Growers School Coordinator and AmeriCorps Service Member, have spent some time designing the plant layout, dealing with soil and drainage issues, and obtaining city approvals. All of the labor and most of the plants, supplies and tools have been donated by members of the neighborhood, or paid for with funds raised from silent auctions of items donated by neighbors and local businesses. Neighbors will begin planting at 10 a.m. on June 11. The completion of the Five Points garden comes at a time of growing awareness of the need for sustainable habitats for pollinators, which are vital to feeding the planet. The Bee City USA Pollination Celebration in Asheville will be held June 16-25.